Above: Casa Jacobo Peuser letterhead dated 1954, giving the head office address as San Martin 200, Buenos Aires. Jacobo Peuser was a German immigrant, born on 28th November, 1843 in Hesse-Nassau, who arrived in Argentina in 1855, aged 12. The young Jacobo started working in Graphics workshops. In April 1867 he opened a small bookshop in Buenos Aires. Such was his passion for graphic arts that the following year he purchased larger premises and his business continued to grow. The business was involved in the importation of foreign manufactured playing cards into Argentina during the period (approx.) c.1920-1950. As can be seen in the examples shown below, the importer's details were overprinted on the Ace of Hearts and the tax band which was fixed around the sealed pack. Cards from England manufactured by John Waddington and also cards manufactured in USA by the U.S. 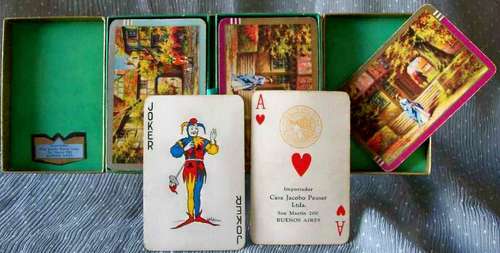 Playing Card Card Co. are known to have been imported by Casa Jacobo Peuser. 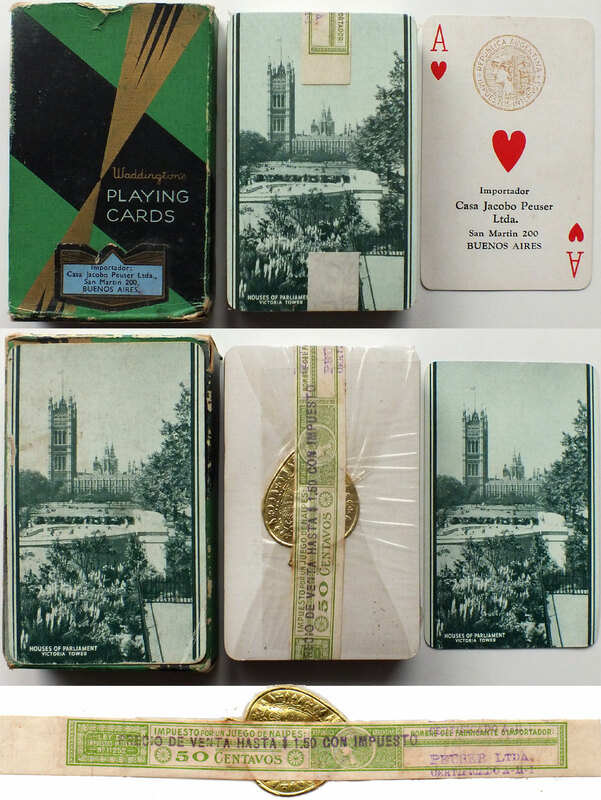 Above: pack featuring the "Houses of Parliament / Victoria Tower" (London) manufactured in England by John Waddington, imported into Argentina by Casa Jacobo Peuser Ltda, c.1938. The importer's details "Peuser Ltda" are overprinted on the ace of hearts and at the right-hand end of the 50 Centavos green tax band fixed around the sealed pack (Decreto No.11,252, 1924-1943). Several others including 'Beautiful Britain' packs with iconic views of London, such as "Tower & Tower Bridge" are also known to have been imported by Jacobo Peuser. Above: 2 Pesos yellow taxband overprinted with the new name "Casa Jacobo Peuser S.A.C. e I". Decreto No.18,235, 1944-1964. 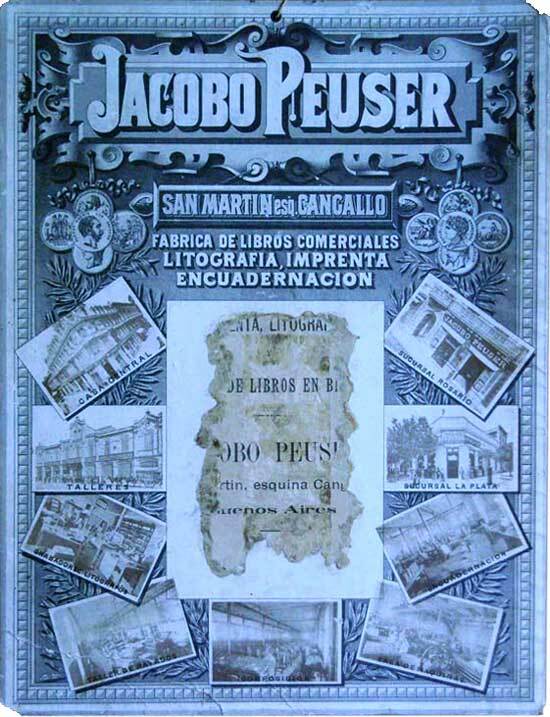 Left: Jacobo Peuser advertising sign, colour lithography, c.1890s. The sign shows several medals and mentions book publishing, book-binding and lithographic printing as the primary business activities, along with photographs of the head offices, subsidiary branches, workshops, etc. Approx size: 350 x 460 mms. The central area appears to have held a calendar which has been torn off. Left: Double pack with pictorial backs manufactured by John Waddington and inported into Argentina by Casa Jacobo Peuser Ltda, c.1930s.